School vacations are going to end soon. Yes, my two kiddos are going to start their school on August 16. I am excited and at same time somewhat relieved that there will be a break from the 24-hour duty that I have now. Now a day I wake up late in the morning. But when school starts it is going to come to an end and, I must rush for my breakfast. That is when this cherry mango layered smoothie bowl comes in handy. These are not only delicious but also filling too. This recipe is vegan too, I used coconut milk but you can use your favorite milk. Small Cherries are big packet of antioxidant, anti-inflammatory and rich in fiber, vitamin C, carotenoids and anthocyanins. Mango on the other hand are not only my favorite fruit, but is also rich in fiber, pectin and vitamin C and helps to lower serum cholesterol level. Rich in vitamin A too, if you can make a breakfast with good ingredients that taste great why wait. The only work you need to do to make this recipe is just puree everything. For a layered smoothie bowl, you need puree them separately, that is only thing you keep in mind. Otherwise it won’t justify its name. I used fresh strawberries, mango, banana and chocolate granola along with toasted hempseeds. You can play with topping of your choice. Best part of this cheery mango layered smoothie bowl is it has no added sugar. Only sugar is from the fruit and granola I used. I always try to make no extra sugar added breakfast dishes. I like cinnamon rolls however nowadays due to health conscience I am not having them for my breakfast, but sometimes as a dessert. You like something colorful for your breakfast, then try this. Chances are high that you will like it my hubby who is not a smoothie person, but told me after doing a taste test this is delicious. Then start making this. Delicious and colorful cheery mango layered smoothie bowl with no added sugar. Process the cherries with 2 tablespoon of coconut milk and set aside. If you want to thick consistency add ½ bananas with cherries. Then process mango, banana and rest of the coconut milk and set aside. Transfer the mango puree into the bowl carefully then using a spoon create barrier and add cherry puree. 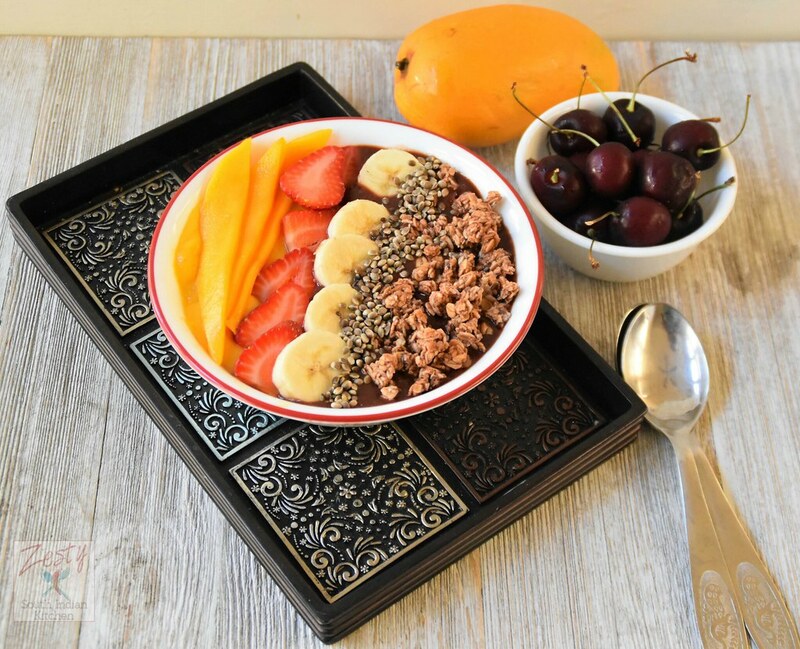 Top with sliced strawberries, mango, banana and chocolate granola and toasted hemp seeds. What a fabulous combination of ingredients. This is a bowl I could eat every day! This smoothie bowl has everything that I like in it! I love fresh cherries and mangos. Yum! That looks like a great way to start the day with! School days are notorious for being busy first thing in the morning. We often fall into the toast and cereal routine but my kids are always thrilled when there is something different on offer. I know they would be happy with these cherry mango bowls. Our school hols have only just begun (UK) so I’m going to treat them to this is the next few days. What a wonderful mix of ingredients and textures! I do like to enjoy a smoothie in the morning but still haven’t tried a smoothie bowl! HAHAHA….I have fresh cherries and mangos in my fridge right now. This would be the perfect lunch for tomorrow. My son starts school THIS week!! That smoothie bowl is so perfect, cherries are fresh and in season – that looks and sounds fantastic. 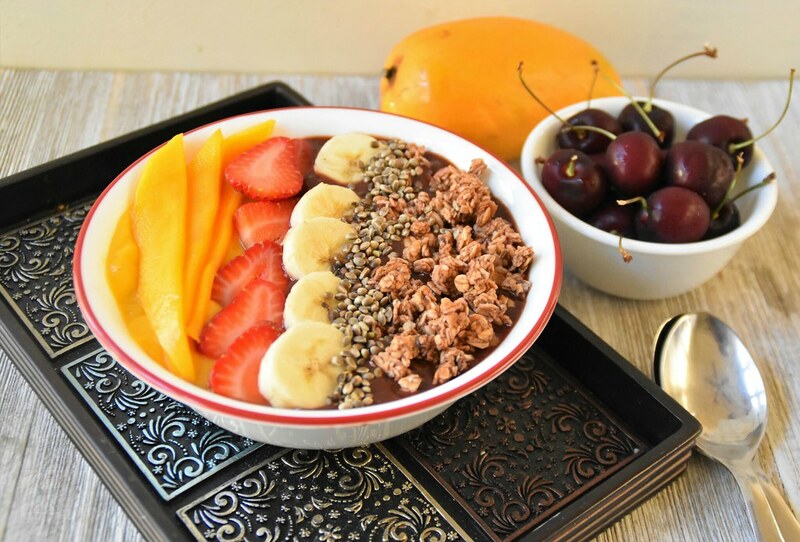 Smoothie bowls are so popular right now! I keep saying I’m going to make one, and never do. I really need to print this out and make it! I love smoothie bowls! Especially loving this Cherry Mango variation. Have to try this soon! 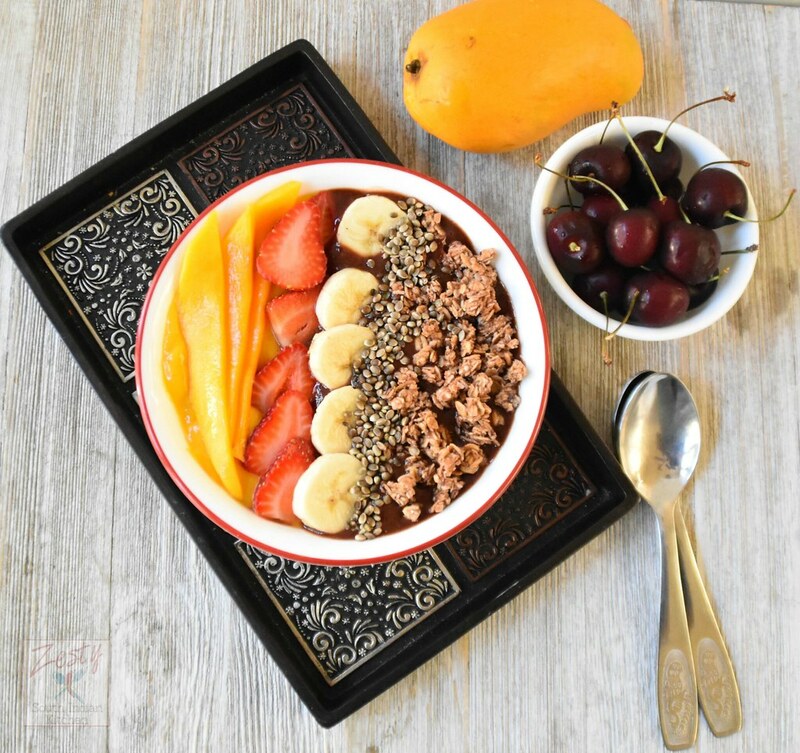 Love smoothie bowls and they are becoming so popular these days..!! Love this combination of cherry and mango.. Yum. This looks so tasty and pretty!! I have never heard of a smoothie bowl before.. My kids are not back ion school til September. They have been off since June. Long school holidays here!! This is exactly my kind of smoothie bowl! Don’t you just love how easy they are to make?! And super tasty too, perfect for the mornings! You got me at mango, I am a lover of mangoes and this smoothie bowl looks very pretty and bet it is yummy too nothing like fresh fruit. Seems like an awesome combination of ingredients, Swathi! The perfect way to start the day!